I reviewed Theresa Romain twice in 2014, here and here, and I loved her books both times. When I saw this one by her, it was a no-brainer to pick up! A Gentleman's Game is a fantastic historical romance featuring the middle class. Nathaniel is the son of a Baronet, part of a family who are embedded in the business of raising, breeding, and racing horses. Rosalind is the daughter of a couple who run an inn, working now as a secretary for Nathaniel's father. I loved how fresh the story felt. I've never read a horse-racing-centric romance before, and romances between people in this middling class are only just beginning to become popular, I think. I loved all the evidence of the heroine's status, from clothing references to what she values. And Nathaniel's concerns around supporting himself and what he can do for work were also quite welcome. The best part of the relationship, I think, is the excellent banter between Nathaniel and Rosalind. I quite enjoyed all the interaction between these two. I also really liked Rosalind's family, and would be happy to read more about them in the future. As for the horse-racing side. I thought that there was just enough horse and racing information to ground the story. Those details were important to give context, and I never felt that they overwhelmed me. I found considering the logistics of horse racing, historically and even in the modern age, really interesting. Obviously moving horses across the countryside was, and is, much more challenging than moving their human counterparts. The romance itself is fantastic, the setting is great. Really, my only complaint is that the story line beyond the romance gets a bit messy around the climax and resolution. I wasn't completely sold on the explanations or the way that everything played out, and some of it felt like a bit of hand-waving so readers wouldn't poke it too hard. Regardless, the parts I cared about the most were excellent. 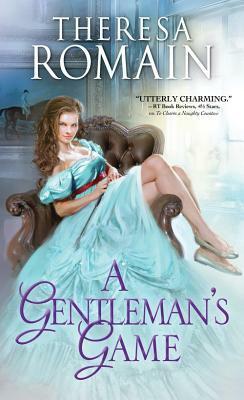 A Gentleman's Game is a delightful historical romance featuring two characters that are rather unusual in the genre. I happily recommend this one!